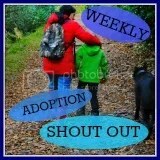 Is discovering with each passing day how lonely and judged the adoption journey can be. Some try, but very few understand, so instead I find myself opening up to strangers who are on the same journey as they’re the only ones that can truly understand, the ones that have walked in my shoes and are still walking their own journeys, some now lucky enough to have found a spring in their step, hopefully I’ll find my spring soon to! Thinking of starting up a local support group! Well its been an interesting week to say the least. Firstly my big girl is still struggling at school and the school don’t seem to be being very proactive about helping her which means I’m constantly having to chase them for support for her. They have finally taken note and began some work on helping her make friendships with some of the girls in her class this week. So fingers crossed that will help her. Although having seen her in school when I was invited to sit in one of her 1 to 1 class I see she clearly struggles emotionally at school. The little girl I saw in school was not the little girl I know, she was stressed and hyper and anxious, her behaviour was ‘typical for that lesson’ according to her teacher, which is a worry because it showed me how insecure she is feeling at school, how do I help her with that then I wonder……..
Then there’s my little girl, the little whirl wind of giggles and emotions that hides so much behind her beautiful smile. She’s fighting for status in our family, she’s trying so hard to ‘fit in’ with her sisters who up until a little over a year ago she’d only spent just an hour a week with. She’s 4 and has suffered the most loss of all my girls, in the last 12 months she’s had to get to know a new Mommy and Daddy, a new house, new smells and sounds, get used to living with her sisters and sharing attention, get to know new nannys and grandad’s, new auntie’s and uncles, new cousins, neighbours, friends and other family members, she’s started a new school with new smells, new friends, new teachers, then there’s all she left behind. Its hardly surprising she’s a little whirl wind who doesn’t know if she’s coming or going, she’s had more to deal with and more loss to cope with in her 4 years than some do in their whole lives, so comes the question, how to help her?! Well a parenting course aimed at dysfunctional family’s was what we were offered. We’re not a dysfunctional family, we parent all of our girls very well, and effectively, our girls are not disobedient, we have firm boundary’s and have always been consistent, but our girls are traumatised and are all dealing with it differently. No amount of reward charts and time out is going to help her with that, so what will I wonder………………..
Then there’s my middle girl, she currently appears on the surface to be a happy, contented, secure little girl to the outside world. However we see through her facade, she’s a ticking time bomb, with all her emotions and worries built up inside her tying her in knots, I wonder how long is on the timer and how we can help get it all out so when she blows, its just a blip and not a nuclear disaster……………..
We introduced the girls to some friends of ours and their newly placed/adopted children. We were a little anxious that it would stir up all sorts of emotions and worries, but they surprised us by taking it all in their stride. I guess it could raise a few questions over the next few days, but for now it was just a lovely BBQ with friends and the girls did us proud by being very well behaved! When did it happen, when did my dreams and aspirations of becoming a therapeutic, calming and nurturing Mommy disappear and leave behind the reality of a shouty tired Mommy! It isn’t what I imagined, I dreamed about days of baking and making, playing and enjoying the wildlife and countryside with my children, My respectful, honest, thoughtful children that knew and understood our values and the way our family works, shared our interests and listened when people spoke, I envisaged children that adored me and that I equally adored! I didn’t anticipate children that would be so demanding of my attention and be so competitive with each other that it would be too physically and emotionally draining to do any of those things and the reality would just be me spending my days shouting……..a lot and usually for the same things over and over, I didn’t anticipate children that wouldn’t appreciate anything and would always take for granted and expect more, I didn’t foresee them seemingly enjoying pushing the buttons I didn’t even know I had, I didn’t conceive the possibility that they could be so manipulative and controlling and argumentative……………………I didn’t anticipate there would be days when I really wouldn’t like them very much! Seems I wasn’t ‘really’ prepared for the reality of traumatised, neglected children! My middle girl walked up an isle in a shop today and a woman was blocking her path so she innocently said ‘beep beep’ and expected her to move, of course I made her apologise to the lady who found it quite amusing thankfully and then i informed my daughter that the correct term should have been ‘Excuse me’. Oh how I laughed, inside!